In a breakthrough, the Gujarat police today detained two persons in connection with the September 24 terrorist attack at Akshardham here and also traced the white Ambassador taxi that had taken them to the shrine. The suspended Haryana Inspector-General of Police (Prisons), Mr Ravi Kant Sharma, who is the prime accused in the Shivani Bhatnagar murder case, surrendered before the Chief Judicial Magistrate, Ambala, Ms Sarita Gupta, this evening. The suspended Haryana IG, Ravi Kant Sharma, who surrendered before the Chief Judicial Magistrate, Ambala, today, has been kept in a special cell in Block No 2 of the Central Jail here. According to informed sources, Sharma has been kept in a separate room as per the directions of the court. 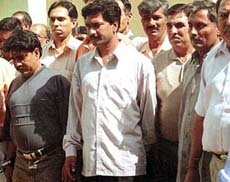 The Delhi police special cell has arrested three associates of underworld don Abu Salem in South Delhi. 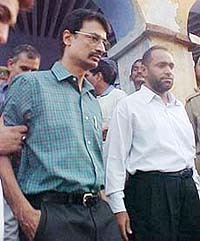 Three alleged accomplices of underworld don Abu Salem, who were arrested in South Delhi on Thursday, are escorted to the courts on Friday. The Punjab Government today removed 39 PCS (Judicial) officers from service in compliance with the order of the Punjab and Haryana High Court. If you want to become a farmer, then you must remember P is for politician, P for power, P for paddy, P for postponement and P for poor farmer...! The Centre is likely to announce relief for farmers in the form of bonus, waiver of interest for a year on loans and availability of foodgrains at below poverty line (BPL) prices. Sources said the Commission on Agricultural Cost and Prices (CACP) has suggested a bonus of Rs 20 per quintal over the MSP for paddy in view of the drought conditions. There is widespread consternation in both the Congress-ruled Punjab and the Opposition SAD with the Vajpayee government retaining the minimum support price (MSP) of paddy at Rs 530 per quintal. Prime Minister Atal Behari Vajpayee today assured SAD chief and former Punjab Chief Minister Parkash Singh Badal that the Centre would compensate the farmers either in the form of bonus or in some way. Much before the enactment of the Transplantation of Human Organs Act, 1994, which bans the sale of vital human organs, the trade was very much prevalent in this city with the connivance of the doctors concerned.